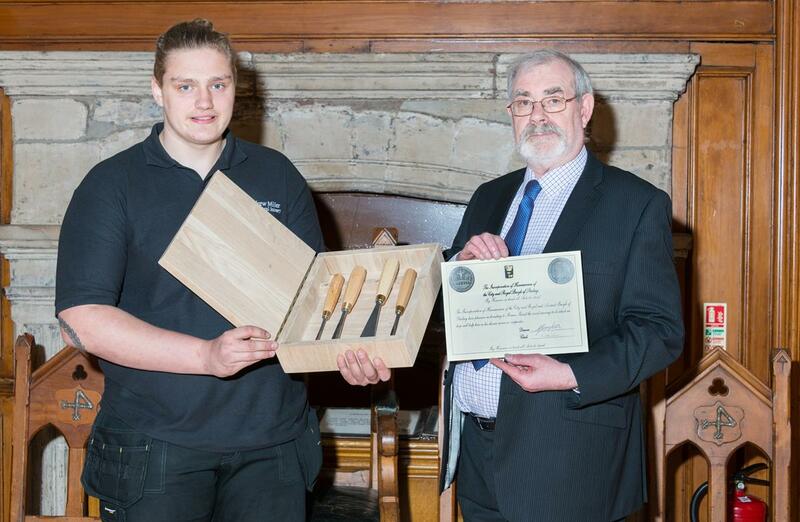 Local lad Rowen Baird, training to become a traditional joiner, was recently made an award from the Incorporation of Hammermen, one of the Seven Incorporated Trades of Stirling. Rowen has been undertaking a year-long placement in Stirling through the ‘Skills for the Future’ scheme funded by the Heritage Lottery Fund¹ and managed by Historic Scotland. The ‘Skills for the Future’ project supports traditional building skills through funded vocational placements with leading craft people in the wider heritage sector. The scheme aims to address shortages in many of the skills required to repair and maintain Scotland’s traditional buildings and structures. The objective of the scheme is to create vocational training programmes where bursary holders gain a deep practical and technical understanding of key traditional skills while also increasing their employability skills. Rowen has been placed with local specialist architectural joinery firm owned by Andrew Miller, whose work focuses on traditional buildings. Rowen has spent a year with Andrew’s firm covering a wide range of bespoke joinery techniques and has also received regular wood carving and letter cutting tuition from local master carver Richard Douglas. 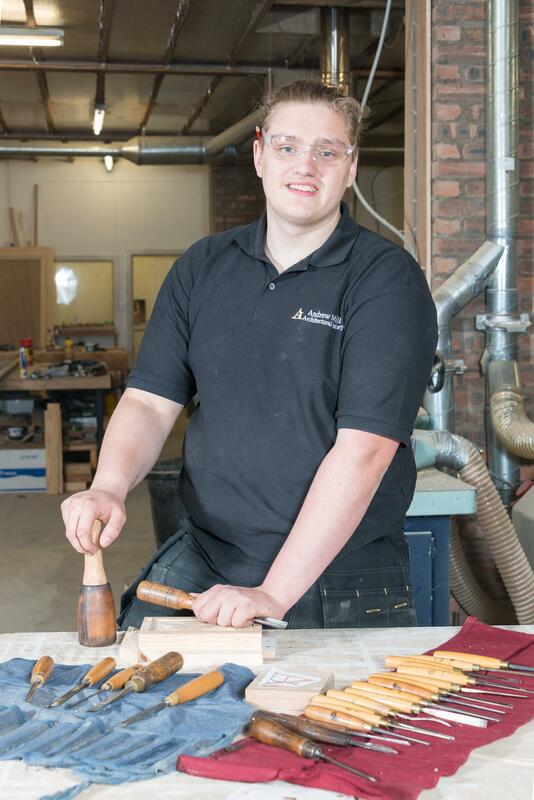 Rowen is now due to move into a formal four year joinery apprenticeship at Forth Valley College in the autumn. Ian Walker, Building Crafts Development Manager from Historic Scotland said “Rowen is just the kind of keen young person that the Skills for the Future project aims to upskill and bring into the heritage sector. To gain a year’s practical experience with a specialist company like Andrew Miller and his team will set Rowen on the path to a bright career working with traditional buildings. We need to keep these skills alive to ensure that our historic environment survives for future generations and this can only happen with the commitment to passing on of traditional skills by experts like Andrew Miller and Richard Douglas”. ¹ Using money raised through the National Lottery, the Heritage Lottery Fund (HLF) aims to make a lasting difference for heritage, people and communities across the UK and help build a resilient heritage economy. From museums, parks and historic places to archaeology, natural environment and cultural traditions, we invest in every part of our diverse heritage. HLF has supported more than 3,000 projects with an investment of over £611 million across Scotland. http://www.hlf.org.uk.